Give me a Gary Oldman villain over any other baddie, any day. Check out our first glimpse of Denzel and Gary's post-apocalyptic power struggle. Quiet Earth found these great stills from White Mountain Wheels, who just happened upon the set. 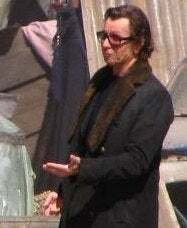 I have to say one coy smile from Gary Oldman, and I am sold. The movie follows Denzel, as he treks across a burned world spreading the word from his "book of Eli." When he gets to Oldman's camp, crafty Gary and his team of shabby-looking ruffians devise a way to capture this book, which holds the secret to saving humankind. The Book Of Eli will be released in theaters on January 15, 2010.